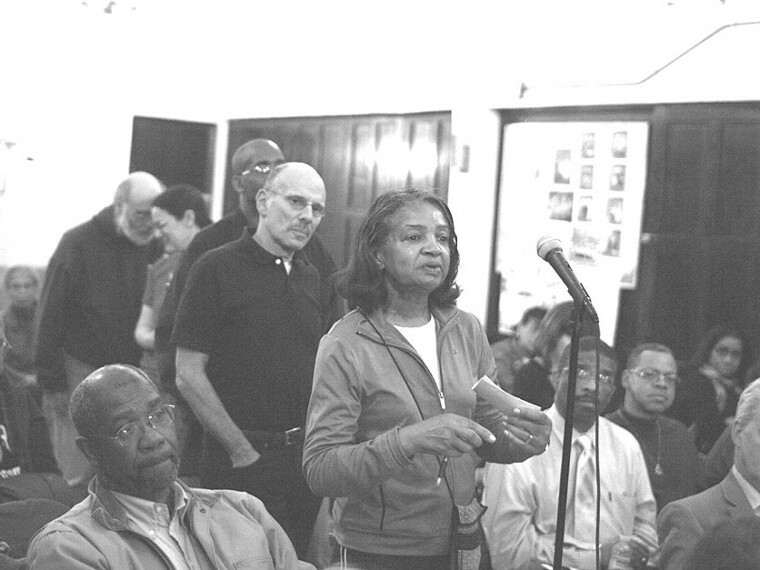 It was a full house at the Lefferts Manor Association sponsored “Landmarks Forum” at the Church of the Evangel on Bedford Ave on Thursday, April 29th. There was not just one but THREE representatives from the NYC Landmarks Preservation Commission. 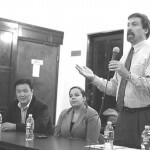 John Weiss, Deputy Counsel involved with enforcement, Jenny Fernandez, Director of Intergovernmental and Community Relations, and Tenzing Chadotsang, Director of Grants and Outreach. There was a steady line at the microphone to ask questions, make comments, log complaints and to vent in general. Off the top it was noted that violations are complaint driven which means that a third party has to actually log a complaint for a violation warning letter to be issued and that not all complaints in fact become violations. Landmarks doesn’t patrol neighborhoods looking for violations. And only if violations repeatedly are ignored, can fines be issued by a judge at the Environmental Control Board. 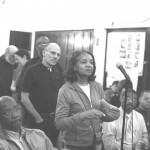 A question from the audience brought out the point that if you get a complaint about one issue on your property that the Landmarks compliance officer assigned to your case may cite you with other conditions that are in violation when visiting your residence to assist with correcting the first violation. This highlighted the importance of being proactive in fixing “wrongs” before they become violations remembering that there is a responsibility in being a homeowner in a NYC landmarked historic district and that care must be exercised when undertaking work to the exterior of these properties. A very helpful guide is the LPC’s Rowhouse Manual which is a publication that can be downloaded as a PDF from the “Forms and Publications” section of the Landmarks website http://www.nyc.gov/html/lpc. It outlines the items that LPC considers ordinary maintenance that do not require Landmarks permits and it outlines the items that do require Landmarks permits. LPC staff will assist and guide homeowners in making decisions about what to do. Also on the website is information about how to apply for a Landmarks permit. An application form and a copy of instructions are available for download or it can be obtained by calling the LPC at 212-669-7817. You can email them directly with questions at info@lpc.nyc.gov. An interesting point was made by the LPC representatives. All homes were photographed at the time when the Prospect-Lefferts Gardens historic district was designated in 1979. What was there at that time is allowed to remain even if not original to the building. Conditions that wouldn’t necessarily be approved by Landmarks are grandfathered-in and are only required to be changed if you decide to do replacement. E.g., if you had aluminum storm windows in 1979 you are allowed to keep them but if you replace your windows, you will need to obtain a permit from Landmarks and work with them to install what is appropriate for your building. As long as what is proposed fits within their guidelines, permission can be granted and permits issued based on a “staff level” approval. If what is proposed is something new or innovative, a public hearing would be required to obtain the approval. There were complaints made by residents said that the process in obtaining permits was so lengthy that they went ahead and did the work without them, and there were comments made by residents that Landmarks was very reasonable and helpful in dealing with violation and correcting them. Landmarks admitted to the fact that they don’t always get it right and that sometimes violations are issued mistakenly. These can easily be rescinded if you contact Landmarks to work it out. One of our residents received a violation for repainting their house’s cornice green. Since it was green at the time of the historic designation, it is allowed to be repainted the same color without a Landmarks permit. Since the designation photographs are in black and white, in this case the color interpretation was made incorrectly and a violation letter was send out in error. There were a couple of residents of Lefferts Ave in the block between Rogers and Nostrand who were very concerned and frustrated that many of their neighbors on that block were either completely unaware that their block was in a historic district or they did work to the fronts of their house in complete disregard to the fact if they did know. It was suggested that the best way to start educating block residents is to invite Landmarks to a block association meeting. Not everyone will show up but through word of mouth slowly things can change. Recently the Landmarks community liaisons met with Sterling Street residents and now there are four projects on that street that received grants to do work to the fronts of houses. The Historic Preservation Grant Program is a federally funded program that provides grants for homeowners to restore the facades of buildings located in historic districts. Grants range from $5000 to $25000 and pay for exterior repairs only (masonry rebuilding and repointing, repair and replacement of windows and front doors, and cornice restoration). There is an income limitation on qualifying for one of these grants. 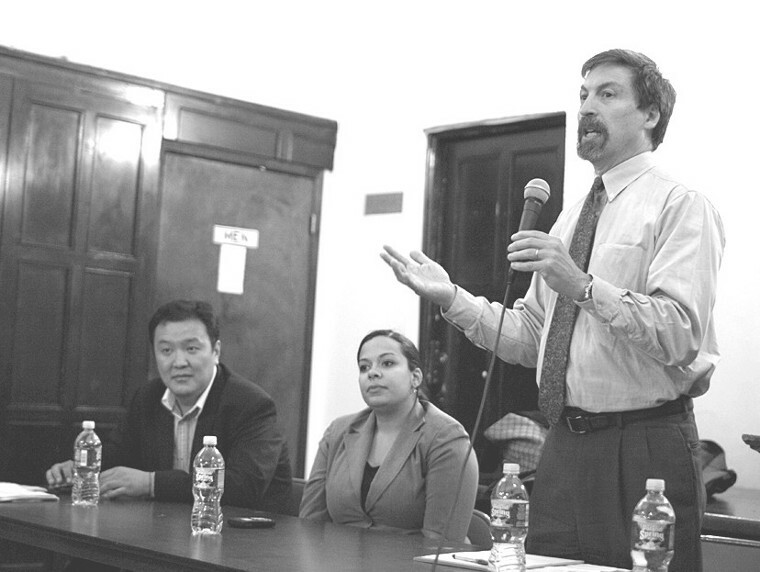 Contact Mr. Tenzing Chadotsang, Director of Grants and Outreach, tchadotsang@lpc.nyc.gov or 212-669-7944 for more information. A source for low-interest rate loans is the Historic Properties Fund through The New York Landmarks Conservancy. Contact: www.nylandmarks.org or 212-995-5260. Lefferts Manor Association President, Ben Edwards will be meeting with staff members of the Landmarks Preservation Commission to resolve some of the pending landmark violations issued to home owners in Prospect Lefferts Gardens. If you would like your issue to be addressed, you can email Ben Edwards at lmabedwards@aol.com before May 20, 2010.